Seriously, do not keep reading on this old page. The only reason I didn't delete this page is because it comes up in searches. But it has not been updated and there is more information on my new experiment website. 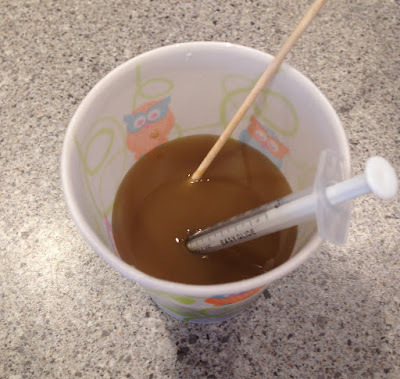 Please read my essential oil experiments here. 6 Does Thieves oil kill bacteria? 7 Which Essential Oil kills bacteria the best? 8 Do Oregano Oil and Clove Oil kill bacteria? 9 Do Lemon, Peppermint, Cinnamon, Tea Tree, and Arborvitae oils kill bacteria? 10 Does Lavender oil kill bacteria? 11 Does Thieves oil work as a hand sanitizer? 15 Can I dilute Thieves and On Guard oils with water to clean? 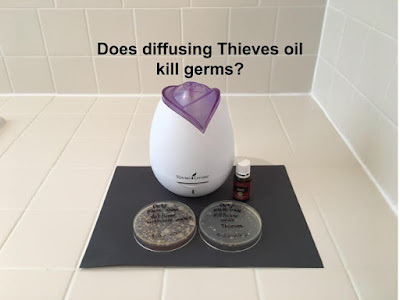 16 Does Diffusing Thieves Oil Kill Germs? If you would like to be alerted when new experimental results are posted, please like the Dr. Annie's Experiments facebook page that I made. I'll post on there anytime I put new results up here. I am also very proud of my daughter, Katie Scarlett. She started writing, illustrating, and publishing a delightful book series when she was just 8 years old. She is now 9 years old and has published Princess Katie and the Fairy Tea Party , Princess Katie and the Mermaid Lagoon , Princess Katie and the Kitty Club , and Princess Katie and the Sweet Shop are available on amazon. The stories are so sweet and teach about kindness, forgiveness, including others, working hard, and doing the right thing. I think every little girl would love them! Please consider buying them for a little girl that you love. Katie gets about a $2 royalty from amazon for each book sold that is getting deposited into her college savings account. My research is not supported or affiliated with ANY of the essential oil companies. In fact, they are all pretty mad that I am doing it. The FDA would like you to all know that Essential Oils are not allowed to claim that they treat or cure any diseases or conditions. I am in no way implying that essential oils "Stop the Stomach Flu" because that is the name of my website. I do not use or sell essential oils. I am not a medical doctor and nothing I say should be taken as medical advice. I am not even sure if using and diffusing essential oils is SAFE for you. Just because something is "natural" or "organic" doesn't mean it is safe. Always follow the manufacturers directions when using essential oils, cleaners, hand sanitizers, and any other product in the world. And don't let children play with plastic bags or get near the hot stove. Got it? From my results, all of these Essential Oils appear to kill bacteria. I tested On Guard, Proshield, and Thieves many times. If one of those is better than the rest, my experiments are not sensitive enough to detect the difference. I only tested the Plant Therapy Oils twice (because I got them later than the rest). Both times, the Kidsafe Germ Destroyer left a few colonies of bacteria. I think it absolutely kills bacteria, it just might not be quite as strong as the others. I can’t tell you if these Essential Oils would kill every single kind of bacteria, and I can’t tell you if they would kill viruses. As I mentioned before, it is possible that the oils are preventing the bacteria from multiplying by some means but are not actually killing them. However, since the Essential Oils do even better than olive oil, I think they are really killing bacteria. I also can't tell you if the oils will cure all of the assorted ailments that they are recommended for. I do believe that these Essential Oils really kill bacteria, though. A lot of people are diluting thieves oil and are using it as a hand sanitizer. The suggested dilution is 1 drop of thieves oil and 4 drops of a carrier oil. 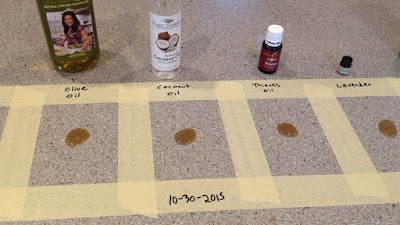 So, I used my thieves oil/olive oil mixture that is in a spray bottle, and I used my 10 year old son's hands. I used these amber spray bottles from amazon. I was so surprised that they could spray thick oil nicely without clogging. I did the experiments after school before my son washed hands. It would have been nice if he had 4 hands because I wanted to test 4 things. Since he didn't, I divided up the fingers. I rubbed his thumbs on the dirty control plate. I put olive oil on the first 3 fingers of his right hand. I put the thieves/olive oil combo on the first 3 fingers of his left hand. I put Clorox Hand Sanitizer on both pinkie fingers. 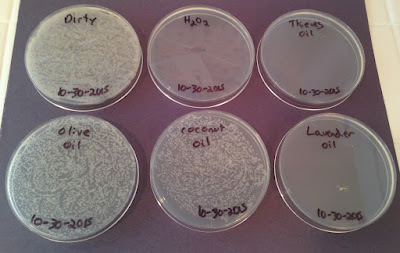 I let the sanitizer/oil sit on his fingers for 1 minute, and then rubbed those fingers on the appropriate agar plate. A hand sanitizer needs to work fast because you don't have much time between putting it on your hands and picking up your sandwich. As you can see, the oils do really seem to kill some germs. However, it doesn't compare in bacteria killing to the Clorox Hand Sanitizer. I like Clorox Hand Sanitizer because it is one of the few hand sanitizers that actually kill norovirus. (For a list of all my favorite hand sanitizers that kill norovirus, please read this page of my website.) If you aren't going to kill stomach viruses, I see no reason to use a hand sanitizer at all. Clorox hand sanitizer is not available in stores but is available here on amazon . Let me first say that a good thorough hand washing with soap and water is ideal. However, there are times when me must eat but can't get to a sink to wash hands. For example, my children are not permitted to wash hands before lunch at school. Some teachers claim that hand washing takes too much time. I think that is ridiculous, of course. However, there are times when you need a good hand sanitizer and I've been trying to find the best ones. I have already tested many hand sanitizers on this page. For this experiment, I wanted to determine if the Thieves Waterless Hand Purifier really killed bacteria. I got the Thieves Waterless Hand Sanitizer here. For this experiment, I used my children's hands and some of their friend's hands. First they rubbed their thumbs all over the dirty control plate. Using a disposable 1mL syringe, I put .5mL of Thieves Waterless Hand Purifier onto their left fingers and rubbed it in with my clean gloved hand. I let the fingers dry for 1 minute, and then they rubbed their fingers all over the agar plate. Finally, I put .5mL of Zylast antiseptic hand sanitizer onto their right fingers. I rubbed it in with my clean gloved hand. I let it dry for 1 minute and then they rubbed those fingers all around an agar plate. 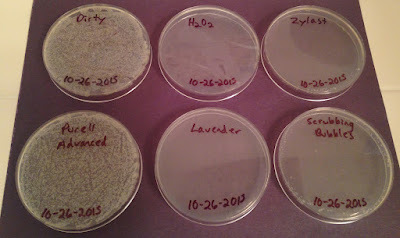 I put the plates in my warm incubator for 24 hours to let the bacteria grow. As you can see, the Thieves Waterless Hand Purifier did a very good job! It is important to note that these hands did not have ACTUAL DIRT on them. As you will see when you keep reading, most hand sanitizers ( except Zylast) don't work well on hands with actual dirt. So, if you or your child's hands are actually dirty, you need to wipe them off with a wipe before using the Thieves Hand Purifier. As you can see, the homemade thieves spray killed some germs but I don't think it does enough to be actually used as a hand sanitizer. I wouldn't trust it. It is also important to note, that these hands all looked clean. They did not have actual dirt on them. As you will see when you keep reading, most hand sanitizers (except Zylast) don't work well on hands covered in actual dirt. I have done many hand sanitizer experiments in the past (which you can see here) that show that most alcohol based hand sanitizers don't do well on hands with actual dirt on them. The alcohol just can't seem to penetrate the dirt. I wanted to know how the Thieves Waterless Hand Purifier and the homemade Thieves Spray do when actual dirt is present. Normally, I would send my children outside to play and then they would come in with dirty hands. However, since there is 6 inches of snow on the ground and the temperature is below zero, this is not an option. So, I tested the hand sanitizers on the dirty countertop, just like I did for the first experiments on this page. I put 1.25 mL of dirty "germ water" on each square, rubbed it all around and let it dry. Then using disposable 1mL syringes, I added .5mL of each hand sanitizer to the appropriate square. I rubbed them all around with a clean gloved hand. I timed them each for 1 minute and then took swabs of the squares. I rubbed the swabs all around the appropriately labeled agar plate. The plates incubated for 24 hours. As I expected, only the Zylast Antispetic hand sanitizer was able to cut through the dirt. Don't feel too bad, Thieves lovers. Purell Advanced and the Clorox Hand Sanitizer do not do well in this test either. My advice is that if you use any hand sanitizer besides Zylast antiseptic, wipe dirt off your hands with a wipe before using your hand sanitizer. To sum up, I am surprised and impressed with how well the Thieves Waterless Hand Purifier killed bacteria in my experiments. Its main ingredient is ethanol like most other hand sanitizers so it is not really THAT surprising that it kills bacteria. We don't know if it would kill norovirus, though. It is also important to wipe off your hands with a wet wipe before using the hand purifier if you have visible dirt on your hands. The Thieves Hand Purifier also smells WONDERFUL. It smells like peppermint and smells so delicious that you need to be careful that your kids don't eat it. If you would like to buy Thieves Hand Purifier, you can order it from www.striveforhealthy.com or buy it from another authorized Young Living seller. Do not buy it from Amazon. Many Young Living Products on Amazon are counterfeit. Clorox Hand Sanitizer Spray has always been a favorite of mine because it is one of the few tested to kill norovirus. It is primarily ethanol and does not contain any chlorine bleach. It dries nicely leaving your hands feeling clean. It is important to wipe off your hands with a wipe before using this hand sanitizer if they are visibly dirty. Clorox Hand Sanitizer is available on amazon. Zylast antiseptic is a wonderful product! It kills norovirus and works on dirty hands! You can order it from http://www.zylastdirect.com/catalog.php. If you use the coupon code "StopNorovirus" you will get 10% off your order. I recommend getting Zylast Antiseptic and NOT Zylast Lotion. The lotion has never been tested for its ability to kill norovirus. It is also available on Amazon. I have many more experiments to do! 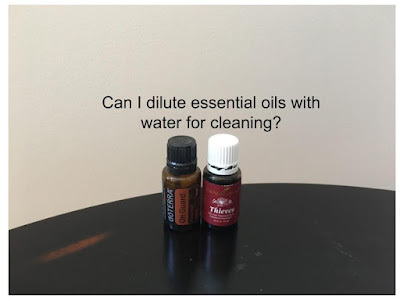 I would also love to find a homemade mixture using essential oils that really does clean and kill germs. So, send me your recipes to test. If you would like to suggest a product or experiment, please e-mail me. My email is at the bottom of this page. If you would like to be informed when new results are posted, please like my facebook page. I always post on there when new results are up. If you would like to help support my work, please use my Amazon links when you shop on amazon. I have an Amazon affiliate account. If you use any of my Amazon links when you shop on Amazon, I get a small percentage of the sale. For example, you can click to Amazon using the link for my daughter's book and buy something. It doesn't matter what you buy, but I will get a small percentage of the sale. I use that Amazon money to buy agar plates and all the supplies that I need to do these experiments. If you don't want to bother using amazon links, you are welcome to send me a small donation through paypal. You can also share this page with others that you think may be interested. If you really want to brighten my day, please buy one of my daughter's books . They are excellent! If you don't have a little girl to give them to, buy a copy for your local elementary school library or children's hospital. Also, before you leave, please brush up on your knowledge of stomach bugs so you can help decrease their spread by reading this page of my website. Thank you!